Part of the Historiallisia Tutkimuksia series. The man of blue landscapes describes the life and work of the Finnish geographer Johannes Gabriel Granö (1882–1956), whose career also reflected Finland’s development as a modern state. Granö was a scientific explorer, writer, a pioneer of Finnish photographic art and a professor of geography at the universities of Tartu (Estonia), Helsinki and Turku. In Estonia he applied scientific method to the study of local history and from Tartu brought the tradition of urban research. Granö spent much of his youth in Omsk in western Siberia, where his father worked as a priest among displaced and deported Finns and Estonians. From 1906 to 1916 Granö made an expedition to Mongolia and the Altai mountains, but his fieldwork remained unfinished when the 1917 revolution broke out; the area was then closed to Western scholars for 70 years. 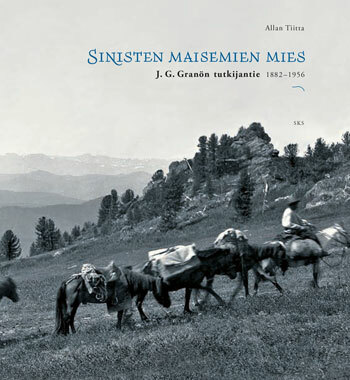 Among Granö’s most important works are the classic travel book Altai, vaellusvuosina nähtyä ja elettyä (‘The Altai, seen and experienced during my years of travel’, 1921) and his methodological masterpiece Puhdas maantiede (‘Pure geography’, 1930). In it Granö outlined a theory of landscapes, and the book was a pioneering work ahead of its time: landscape was examined in terms of the relation between human beings and their environment, as the sum of all the senses.